Nothing has looked good for Noah Syndergaard since he abruptly exited in the first inning of his last start—the news that he’d refused an MRI before the game because he “felt fine,” the news that the Mets had let him do that, and the news that he was suffering from a partial tear of his lat muscle with no timetable for his return. Now, he has a bit of a timetable, and it’s not particularly encouraging. 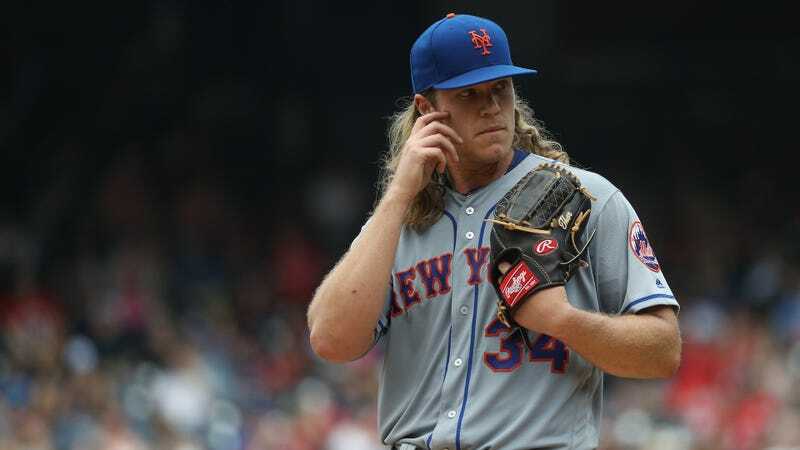 Syndergaard announced today that he’ll have to wait at least six more weeks before beginning to throw in any capacity. That, of course, doesn’t mean six more weeks until his return. Just (at least) six more weeks before he begins throwing off a mound, which will come before a likely week or two of rehab starts, which means that there’s no way he’s coming back before the All-Star Game and potentially even later. The team is considering moving him from the 10-day disabled list to the 60-day. He’s only the most recent Mets starter to land on the disabled list, joining Seth Lugo and Steven Matz. Meanwhile, Matt Harvey is a shell of his former self and, uh... congratulations to Robert Gsellman for an opportunity to become the team’s No. 2 starter so early in his career?